Let cookie dough stand at room temperature 10 minutes to soften. Meanwhile, heat oven to 350°F. Line 10-inch springform pan with foil. Lightly spray bottom and side of foil-lined pan with Crisco® Original No-Stick Cooking Spray. In 12-inch skillet over medium heat, melt butter. Stir in brown sugar and cinnamon until blended. Add sliced peaches; cook 4 to 6 minutes or until peaches are tender, stirring occasionally. Spoon and spread peach mixture over bottom of pan. In large bowl, break up cookie dough. Add baking powder and eggs. Beat with electric mixer on medium speed about 1 minute or until well blended. On low speed, beat in half-and-half an additional minute or until cookie dough mixture is smooth and creamy. Pour mixture evenly over peaches in pan. Bake 35 to 50 minutes or until toothpick inserted into center comes out clean. Cool 2 minutes. Place heatproof serving plate upside down over pan; turn plate and pan over. Remove pan. Carefully remove foil. Cool 5 minutes. Meanwhile, in small microwavable bowl, stir peach preserves and orange juice together until blended. Microwave peach mixture on High 30 to 60 seconds or until warm. 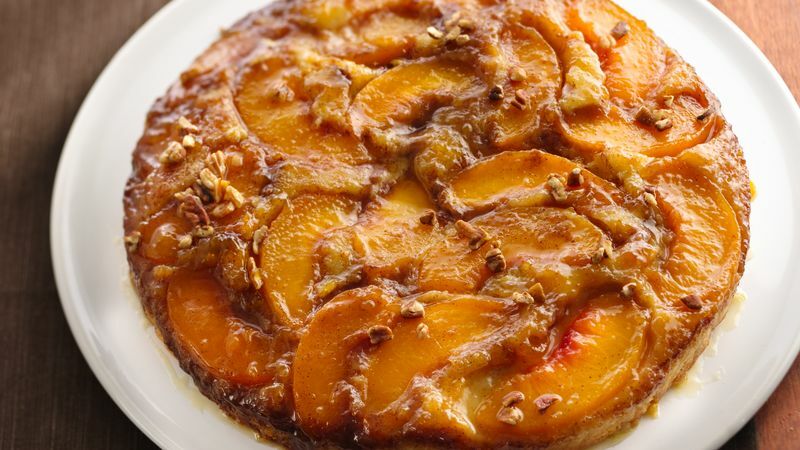 To serve, drizzle coffee cake with peach mixture and sprinkle with pecans.